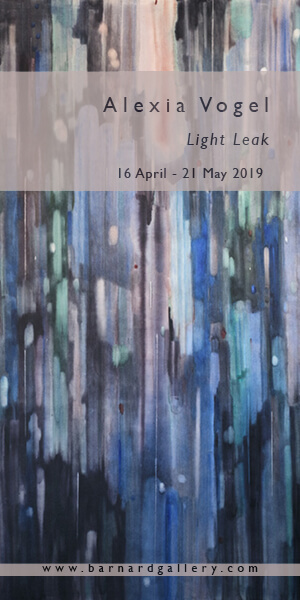 The group exhibition curated by Chandra Frank at Framer Framed in Amsterdam, attempts to open new conversations by addressing silenced trajectories. As the title ‘Re(as)sisting Narratives’ suggests, the exhibition marks a simultaneous attempt to ‘resist’ the prescribed colonial narrative, and through this process ‘assist’ alternate ways of seeing. Athi-Patra Ruga, UnoZuko, 2013. Installation photot from ‘Re(as)sisting Narratives’ at Framer Framed, Amsterdam. Photot: Eva Broekema. Image Courtesy of Framer Framed. The multimedia group exhibition ‘Re(as)sisting Narratives’ is a collaborative exploration towards a decolonial curatorial practice. An encounter with the lingering, unspoken colonial narrative, the exhibition attempts to open new conversations by addressing silenced trajectories. 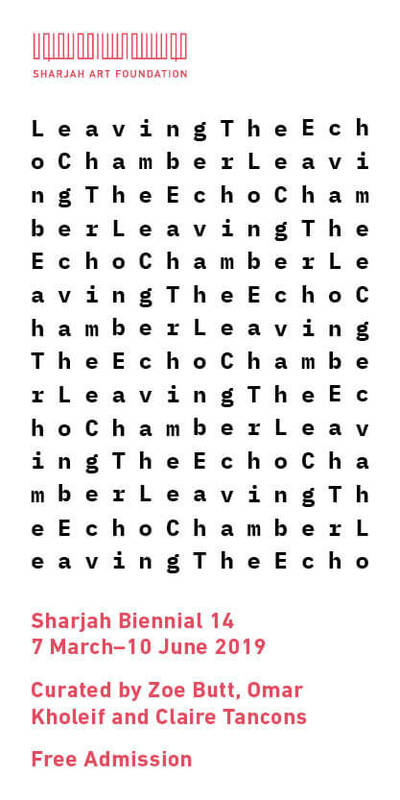 As the title suggests, the exhibition marks a simultaneous attempt to ‘resist’ the prescribed colonial narrative, and through this process ‘assist’ alternate ways of seeing. Shaped by transnational roots in South Africa and the Netherlands, Chandra Frank’s curatorial practice for this group show was brought together through extensive preparation, research, and conversations between herself, the exhibition space Framer Framed, the District Six Museum, and Centre for Curating the Archive over the course of two years. The gallery space for Framer Framed is located at the Tolhuistuin, close to the Amsterdam harbour, a striking symbol of colonial expansion. A replica of an 18th century cargo ship in the harbour bay lays reminiscent of this ‘golden past.’ From here, tourists depart for their canal tours to marvel at the impressive facades of merchant houses in the quaint inner-city. Little is mentioned on how this wealth was built by the Dutch East Indian company, the VOC, through the colonial trade of slaves and resources. The only indication of alternate narratives is provided by the exhibition, which lays across the old inner-city area and converses directly with these dominant stories of the past. The Burning Museum collective from Cape Town participated as a group of artists that use the method of wheat-pasting to disrupt dominant narratives. Tazneem Wentzel, Jarrett Erasmus and Justin Davy created their work on-site, a direct response following their engagement with public life and space in Amsterdam. Their interventions took place inside the gallery and on the Steve BikoPlein in the gentrified area of the Transvaal Buurt in Amsterdam’s East. In their installation, the gaze of two young boys look back at the viewer, their stories framed by the lines of the Native Land Areas Act that restricted freedom of movement for people of colour in South Africa. Drawing on Khoi, Arabic, and Afrikaans, Burning Museum’s work Straatpraatjies intersects language, music, and space, and encounters colonial history through identity and spatiality. Mary Sibande, Conversations with Madam CJ, 2009, Photo: Eva Broekema. Image Courtesy of Framer Framed, Amsterdam. Entering the gallery space the central piece one encounters is Mary Sibande’s installation Conversations with Madam CJ Walker (2009). A mixedmedia installation, this artwork forms part of a series inspired by women in her family that worked as domestic workers. 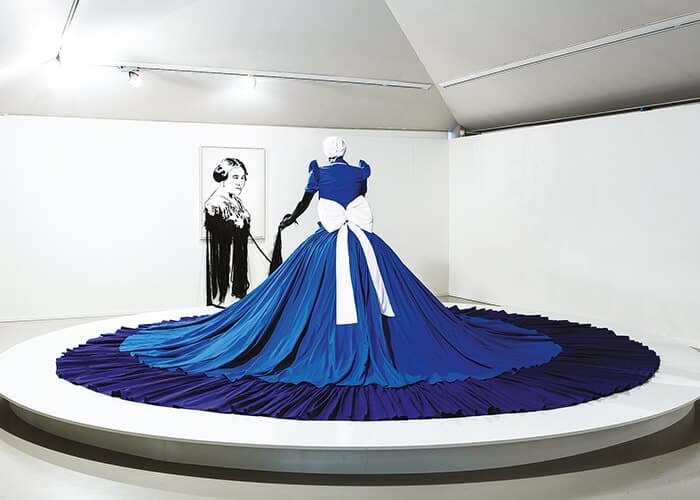 The blue uniform commonly associated with domestic work is transformed into a Victorian dress and embellished by a tall majestic figure, telling a story of beauty and strength. The powerful image of Sophie reaches out towards Madam CJ Walker. Her eyes are closed, and she is holding black streaks of Madam CJ Walker’s dress, made of hair, in her hands. Looking at this conversation with Madam CJ Walker, referred to as the first Black American woman entrepreneur and sociopolitical activist, one wonders about the dreams, aspirations, and transnational bonds of these women and their shared histories. On display, two women from two continents are closely-knit together in the same battles in their intimate spaces against oppression, gender roles and spatiality. Another body of work that speaks to gender and trauma is the installation Krotoa-Eva’s Suite: a Cape jazz poem in three movements by Cape Town-based poet Toni Stuart and filmmaker Kurt Orderson. Listening in feels like an artistic healing practice, restoring what has been taken away through a violent act of silencing womens’ voices and bodies – a resistance of the colonial gaze. Krotoa-Eva’s role as a translator in the Cape, working for Jan van Riebeeck, is directly tied to the construction of shared histories between the Netherlands and South Africa. Toni Stuart’s encounter to return Krotoa-Eva her own voice frees her from all the myths and narratives of othering. Listening in, one reimagines Krotoa-Eva’s life in a new way. Judith Westerveld, The Remnant, 2016, Photos: Eva Broekema. Image Courtesy of Framer Framed, Amsterdam. 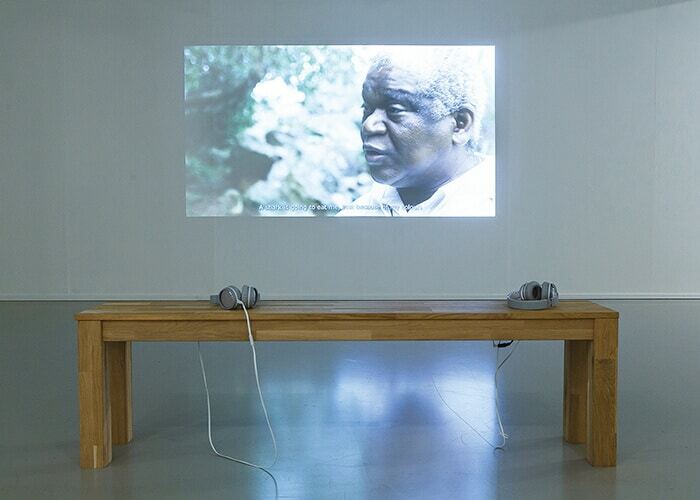 Juxtaposed to this piece is the video installation and photographs of the Dutch artist Judith Westerveld that assists the uncovering of the archive and follows the presence and legacy of Jan van Riebeek. Whilst in Cape Town van Riebeek’s presence is well-known, whether celebrated or contested. Most of the Dutch population however seem to have forgotten about their former colony South Africa. Outlining the remnants of van Riebeek’s almond tree hedge in Cape Town opens the conversation of layered histories and the ongoing traces of colonial spatial division and violence in the city. It’s remnants can still be seen in the well-known Kirstenbosch gardens, yet the stories of stolen land and forced removals are mostly silenced. Westerveld’s work, based on archival material and her own indepth research creates a new understanding of the current struggles. To open the view to new possibilities AthiPatra Ruga’s piece UnoZuko is part of his on-going series ‘The Future White Women of Azania’ and invites one to imagine a new reality for South Africa. 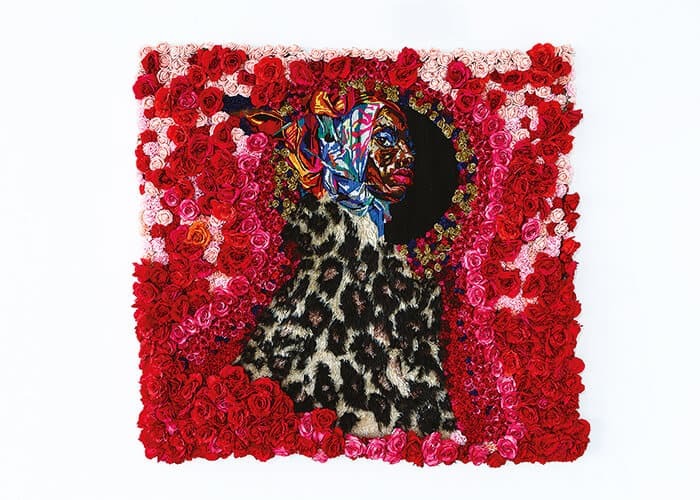 Sethembile Msezane’s works, The Day Rhodes Fell and Untitled (Freedom Day), show what is and could be possible and imagines a new, strong, queer, and decolonized future. Like an Icarus rising, this powerful image of Msezane’s performance stands as an icon on its own and leads the viewer to question the uncertain cultural climate of South Africa. In addition, the public programmes opened the conversations further and created a space of conscious and political education. They formed an important platform to interrogate questions of the archive and addressed white supremacist voices in art spaces and find ways to open up to multilayered narratives. On its return to South Africa, the exhibition will be shown at the District Six Homecoming Centre in Cape Town. Aptly titled, the place serves to commemorate the forced removals through an ongoing memory-making practice. Much like the Amsterdam installment, the work methodology and locality of the space ties in directly with the curatorial framework for the exhibition – a statement which places the contested and shared narratives of South Africa and the Netherlands at the centre of the conversation. Cornelia Knoll holds a Master degree in sociology and works as an arts consultant, writer and researcher. She lives and works between Cape Town and Berlin.